The advent of the all-volunteer force and the evolving nature of modern warfare have transformed our military, changing it in serious if subtle ways that few Americans are aware of. Edited by Pulitzer Prize-winning historian David M. Kennedy, this stimulating volume brings together insights from a remarkable group of scholars, who shed important new light on the changes effecting today's armed forces. 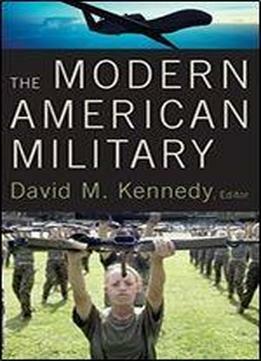 Beginning with a Foreword by former Secretary of Defense William J. Perry, the contributors take an historical approach as they explore the ever-changing strategic, political, and fiscal contexts in which the armed forces are trained and deployed, and the constantly shifting objectives that they are tasked to achieve in the post-9/11 environment. They also offer strong points of view. Lawrence Freedman, for instance, takes the leadership to task for uncritically embracing the high-tech Revolution in Military Affairs when "conventional" warfare seems increasingly unlikely. And eminent psychiatrist Jonathan Shay warns that the post-battle effects of what he terms "moral wounds" currently receive inadequate attention from the military and the medical profession. Perhaps most troubling, Karl Eikenberry raises the issue of the "political ownership" of the military in an era of all-volunteer service, citing the argument that, absent the political protest common to the draft era, government decision-makers felt free to carry out military operations in both Iraq and Afghanistan. Andrew Bacevich goes further, writing that "it's no longer our army it hasn't been for years it's theirs [the government's] and they intend to keep it." Looking at such issues as who serves and why, the impact of non-uniformed "contractors" in the war zone, and the growing role of women in combat, this volume brings together leading thinkers who illuminate the American military at the beginning of the twenty-first century.